Guwahati, January 28: Protecting the nation has always been one of the top priorities for the government. Upgrading the frontier surveillance along the unfenced international border in Assam, the Ministry of Home Affairs (MHA) will induct Unmanned Aerial Vehicles (UAV) also-known-as drones in Assam to keep a tab on the border activities. The move to upgrade frontier survelliance came amid uproar over infiltration of illegal immigrants in Assam and Governor Jagdish Mukhi’s statement that there is no place for illegal foreigners only the indigenous people of the state have the right on its resources. In the meantime, the Border Security Force (BSF) has identified the vulnerable stretches of the border and will deal with technological solutions to the problem. India which shares about 4,000 kms of international border with Bangladesh. As per reports available, the MHA will be managing about 48 kms of such stretch by non-physical barriers. The fencing on stretch of nearly 61 km in Assam is still pending, as per information. A total of 81 battalions of the BSF are deployed over 900 border outposts along the Indo-Bangla border. Security has intended that technical gadgets, including night vision goggles, advanced telescopes, search lights, hand-held metal detectors, hand-held thermal imagers, have already been used and unmanned aerial vehicles would also be inducted soon for effective border management. The Indian government has also started taking steps for strengthening the institutional framework to improve guarding of the border with Bangladesh. Standing committees, headed by the chief secretaries of the states having international border with Bangladesh, have been constituted to evolve a standard operating procedure of the border protection grid. 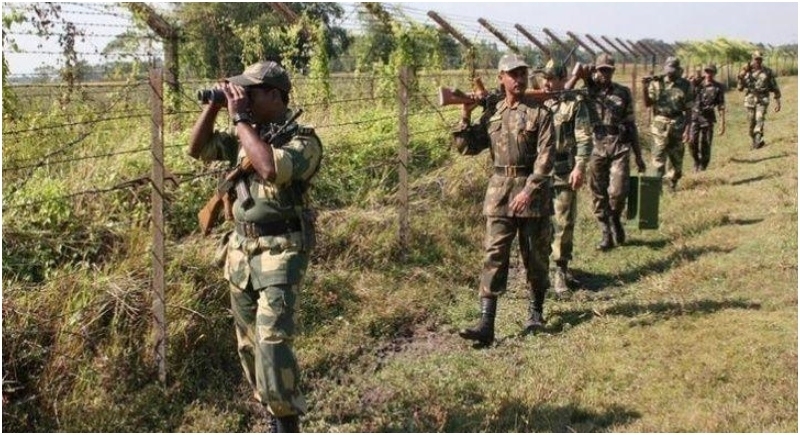 Admitting that the topography of the border makes international border between Assam and Bangladesh vulnerable to infiltration and smuggling, security sources said that dense population right up to the zero line is another problem in ensuring border management. The illegal migrants cross over, mingle with the population of the border areas by taking advantage of ethnic similarities, particularly in Assam and West Bengal, and stay on in India.